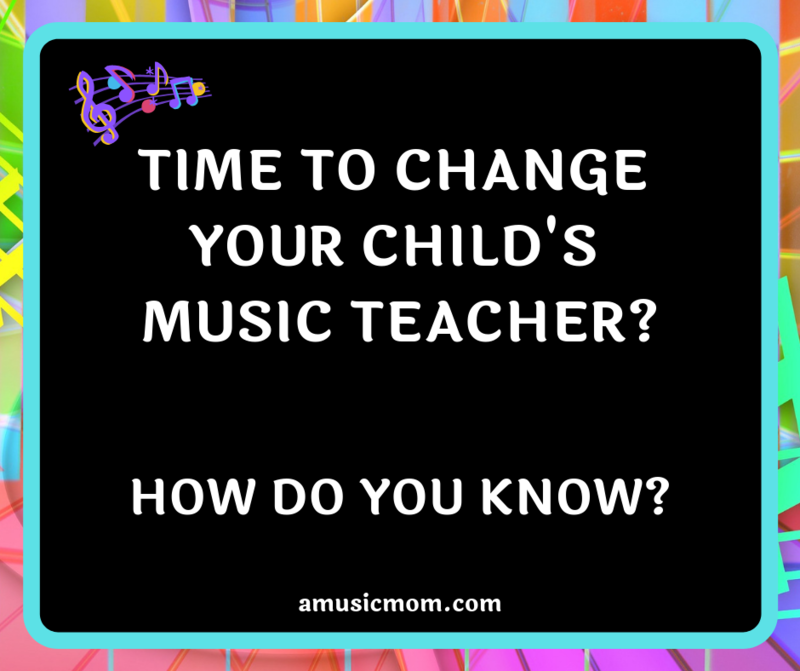 How Do You Know if it’s Time to Change Music Teachers? Thinking about changing music teachers? Why? I’m not saying you shouldn’t, just wanting you to be sure you have thought this through. Your child’s relationship with his music teacher is unique. Think of it this way. Your child spends time, one-on-one, with this teacher almost every week. Often, a special bond is formed between your child and her music teacher. Music teachers can have a great impact on a child’s life. Don’t break this bond without a good reason. Don’t change teachers just because it’s the thing to do. Think this through carefully. Obviously, any hint of abuse, bullying, inappropriate behavior, or anger issues on the part of the teacher should signal that you leave immediately. That should never be tolerated. But if you aren’t at the lessons, how will you know? Does your child leave the lessons in tears repeatedly? Maybe your child will say something. Perhaps another parent will pass on a warning. Maybe your child will suddenly begin to hate going to lessons. If that happens, talk, ask, find out what has happened. A teacher who is constantly unprofessional in her teaching might indicate that it is time for a change. Perhaps she is always late. Maybe the studio always looks like a disaster recently struck. Or the teacher is always distracted during the lessons. Maybe the teacher just never really pays attention to the student. Of course, any of us can have a bad day, but if this behavior is continual, it might be time to consider a different teacher. If either you or the music teacher moves, it might be in your best interest to find another teacher closer to you. A good teacher is worth traveling for, but there are limits, especially when your children are younger. (And if your children suffer with motion-sickness!) Our violin teacher moved four times while my girls were studying with her; each move was a little bit further away from us. Because we homeschooled, we had some flexibility in our schedule so we could schedule lessons to avoid the worst of the traffic. But if the teacher had moved any further away, or only taught during rush-hour traffic times, we would have had to look for someone different. (I am glad we didn’t! She was a wonderful teacher for my girls!) You have to decide what is best for your family. A major personality clash between your child and his teacher might signal that it is time for a different teacher. You want your child to benefit from his music lessons, to progress, to enjoy them. If every lesson turns out to be a battle of the wills, maybe you need to find a different teacher who can work better with your child. Sometimes your child may need a different approach to the lessons. Not all children learn the same way. Your student has progressed to the limit of the teacher’s abilities. Not all music teachers are prepared to work with advanced music students. Some work best with younger students. A wise teacher will recognize her limitations and advise you to find a more accomplished teacher. There will also be teachers who will not see this, and you (or your child) will have to figure this out. Before you change teachers, evaluate. 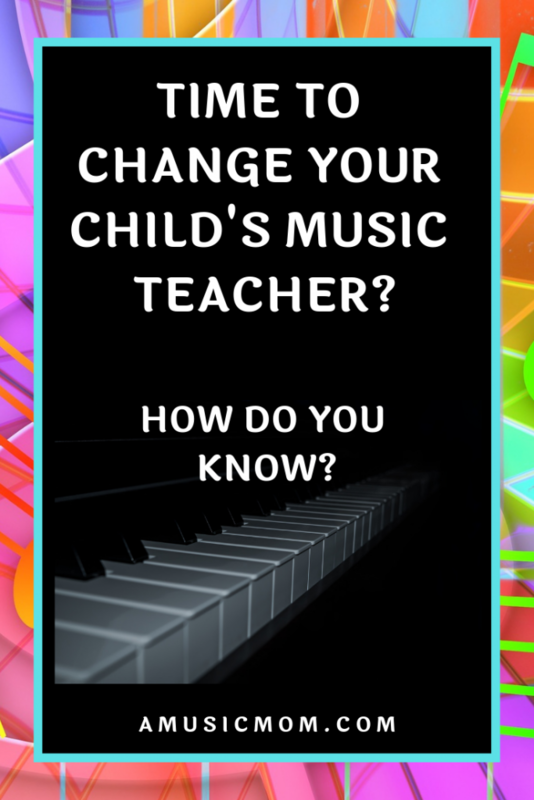 Except for situations of abuse, take time to seriously evaluate your current music teacher before you come to a final decision to change teachers. And look for your child’s input as well. In the current situation, what do you feel is wrong, or missing? What do you want to see changed, or different, with a new teacher? By changing music teachers, what are you hoping to accomplish? I thought this article gave a good approach to this idea. Don’t just not show up for the next lesson. Don’t leave a voicemail telling her you aren’t returning for lessons. Your music teacher has scheduled a time for your child. She has made her budget including your child’s lesson fees. Be considerate of her time and efforts. Give her some advance notice of your decision. Handle this yourself, in a face-to-face meeting. Don’t have your child hand the teacher a note at the end of a lesson. Don’t send an email. Talk to the teacher yourself, explain your decision and reasoning. And set an end-date, a date for the last lesson. If you are on a monthly or semester payment plan, finish out the contract, if possible. Of course, if the situation is at all abusive, leave immediately. I hope you and your child have a good relationship with your music teacher, and will regret, on a personal level, leaving for another teacher. This current teacher has invested a lot of time and effort in your child. Demonstrate your appreciation with a gift. Maybe the only reason your child is leaving this teacher is because she is going off to college. A gift is still appropriate. Sometimes you need to change music teachers. But think through your reasoning carefully. Evaluate why you think you need to change teachers, and what you hope will be different with a new teacher. Show your former teacher respect and appreciation as you leave. You might want to check out this post about finding a music teacher. Previous Previous post: What is a Marimba?